An analysis of NYSE trading volume provides one of the most intriguing big picture forecasts available to investors today. Trading volume, although not a short-term timing tool, acts like a lie detector. Technical analysis 101 teaches us that higher prices on rising volume (often considered a break out) are bullish. Rising prices on falling volume or falling prices on higher volume, on the other hand, are bearish. Volume/price analysis is fractal and can be applied to all time frames. The break out above 1,389 for the S&P 500 Index (SPY) on August 3 happened on low volume. The rally from the June 4 low occurred on low volume and low and behold the rally from the October 2011 low has seen low volume. Theoretically that’s all bearish, nevertheless the S&P 500 Index (SPY) just saw a 50-month price high as the Nasdaq carved out a 12-year high. Obviously, volume is not a short-term directional indicator. Volume, and volume sub studies such as the advance/decline ratio, reveal underlying tendencies that price simply doesn’t reflect. It’s almost like an X-ray for stocks and what this X-ray reveals is extremely interesting and concerning. The chart below plots trading volume on the NYSE against the S&P 500 (since 2005). The daily gyrations of volume make it tough to discern a trend (the big spikes are usually triple witching days), but the red 50-day SMA shows a clear down trend in market participation. 1) Since the 2007 market top the value of the S&P, Dow Jones, Nasdaq-100, Russell 2000 and pretty much all other indexes has been cut in half, doubled and jumped around like a jittery cursor. Investors simply don’t want to put up with the market anymore. Who can blame them? 2) High-priced stocks like Google and Apple (GOOG and AAPL trade close to $700 a share) contribute to lower share volume. According to Tom McClellan, the median share price of all NYSE-listed and traded issues was $14.50 in 2009. Today it’s $23.50. 3) Summer trading is always slow. 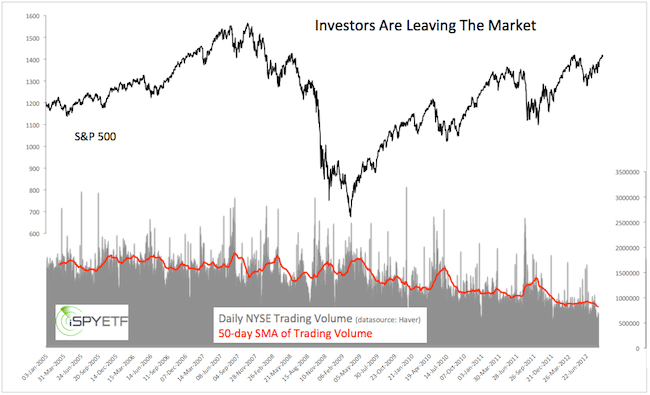 More worrisome than shrinking volume is the actual ebb and flow pattern of trading volume. Within the overall down trend in trading volume there are times when volume spikes quite dramatically. Those spikes reveal investors true feelings about stocks. The chart below plots the S&P 500 against a 10-day SMA of trading volume. Most declines since the 2007 market top have been swift, so a 10-day SMA captures volume increases nicely. The gray boxes highlight that selling activity increases whenever stocks decline. Numbers don’t lie, and volume is like a lie detector that reveals investors true intentions. On balance investors are more eager to sell into declines than buy into rallies. What’s the big picture message of trading volume? Prices for the S&P 500, Dow Jones and almost all major market indexes are still below their 2007 high. This means that the current rally is a counter trend rally, which is confirmed by rising volume when stocks drop and anemic volume when stocks rally. Obviously, the market’s behavior has been distorted by the record influx of faux Fed money, but volume analysis strongly suggests that the rally from the March 2009 low will remain a counter trend rally. This rally may not be over yet, but it looks more terminal than many believe. For a Risk Free Trial of ispyetf.com Click Here to sign-up today! The S&P 500, Nasdaq-100 and Technology Select Sector SPDR ETF are rallying to new multi-year recovery highs spurred by Apple’s record setting performance. As Apple goes, so goes the market, so what’s next for Apple? Monday, August 20, 2012 is the day when Apple became the most valuable publicly traded company ever. That day the stock closed at $665.15 a share, giving it a market capitalization of $623.52 billion. The previous record was set by Microsoft in 1999 when it was valued at $616.34 billion. Apple is most certainly the biggest fish in the pond. How big? Apple accounts for 4.73% of the S&P 500 Index tracked by the SPDR S&P 500 ETF (SPY). The closest second is Exxon Mobil with a weighting of 3.22%. All by itself, Apple’s share price matters almost as much as that of IBM, Microsoft and General Electric combined. While Apple dominates the S&P 500, it outright bullies the Nasdaq-100. 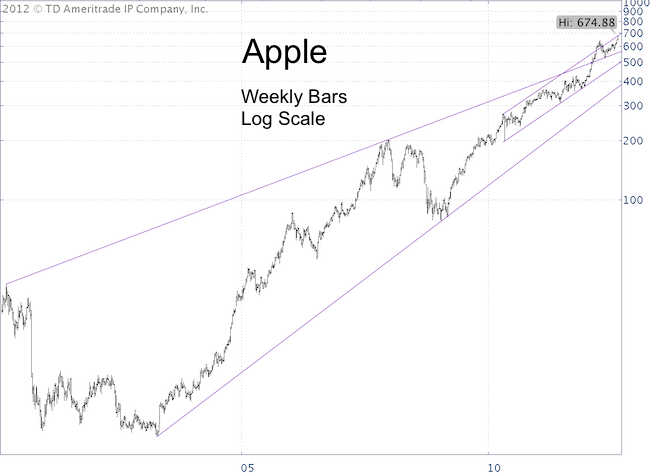 At $665 a share Apple controls 19.65% of the Nasdaq-100 and the ETF that tracks this index, the PowerShares QQQ (QQQ). Even more lopsided is AAPL’s share in the Technology Sector SPDR ETF (XLK), where it accounts for 20%. Apple is so big that when Apple sneezes the U.S. stock market gets a cold. So how is Apple’s health? Fundamental Analysis – New iPhone, New iPad … New Highs? Consumers and investors are highly anticipating the new iPhone 5, the new iPad mini and Apple TV. With the holiday season coming up there are plenty of reasons to expect new all-time highs and record valuations for AAPL. Apple trades at only 13 times earnings and many analysts consider Apple stock cheap. On Tuesday, August 21, the upper trend line resistance is at 679. Shares weren’t quite able to touch the line, which allows for new highs in the coming days. If Apple shares follow the path of seasonal patterns in election years, we should see a top in Apple in late August followed by another seasonal high in November/December. Silver prices rallied to a 2-month high on August 20th. Are further gains on the horizon? Will Small Cap Stocks Catch Up and Trigger a Buy Signal for the S&P 500? “The stock market is doomed because small cap stocks are trailing behind the S&P” has been the financial media’s message. Obviously the market is doomed eventually, but for now this piece of Wall Street “wisdom” hasn’t paid off. Here’s what the Russell 2000 is telling us. Small Cap stocks represented by the Russell 2000 and ETFs like the iShares Russell 2000 Index ETF (IWM) have received their fair share of media attention lately. The focus has been on the under performance of the Russell 2000. This has been considered bearish for the S&P 500 (SPY), Dow Jones (DIA), and Nasdaq (QQQ) since small cap stocks are often viewed as a barometer for the market as a whole. The Profit Radar Report has been promoting an individual and independant analysis of small caps, financials (XLF) and the Nasdaq to get a better read on the big picture. One detailed piece of analysis has shown that under performance by the Russell 2000 is not necessarily negative for the stock market. There have been nine occasions over the last 20 years where the S&P was within 1% of a multi-month high (1,392 on July 30) while the Russell 2000 was more than 5% below a multi-month high (820 on July 5). This led to small negative returns only three times. Even though the whole lagging Russell doom scenario is busted, the Russell broke above key resistance. This happened on August 7, with a close above 800 (a day before XLF broke above resistance at 14.85). Although the Russell was still lagging the S&P, this break was important and signaled more gains for small caps (financials) and the overall market. The chart below plots the S&P 500 (SPY) against the Russell 2000 (IWM) and reveals divergences at various degrees. In May 2011 the Russell 2000 Index recorded an all-time high. The S&P did not. 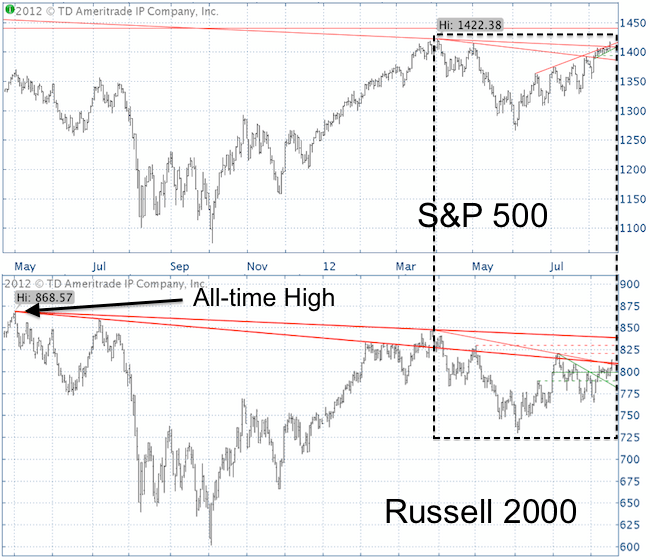 Since then the S&P has nearly reclaimed its 2012 high while the Russell 2000 is about 5% away. The S&P 500 is about 10% away from its 2007 all-time high, while the Russell 2000 is only 6% away from its 2011 all-time high. If you are looking for a divergence between the S&P 500 and Russell 2000, you’ll find more than just one, some bullish, some bearish. The chart below shows immediate resistance for the Russell 2000 and S&P 500 Index (red lines) and short-term support. There are indicators that suggest an upcoming sell off, but as long as prices remain above short-term support (green lines) the trend is up. The Dow Jones – Close to a Once-in-a-Lifetime Signal? The Dow Jones sports perhaps the most unique constellation of our generation. Constellations don’t make money, buy or sell signals do. The Dow’s constellation may double as a signal and is of importance for investors. Since the year 2000 we’ve seen the tail end of a technology boom without parallel, the lost decade, the biggest decline and recession since the Great Depression, record monetary intervention and the strongest rally since the Great Depression. Bulls and Bears can probably agree that we live in unique times. 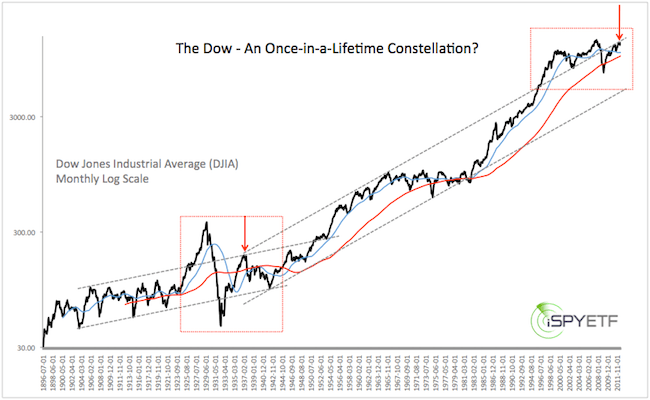 A look at a long-term chart (with long-term I mean going back all the way to 1896) of the Dow Jones Industrial Average (DJIA – corresponding ETF: Dow Diamonds: DIA) shows just how unique. · There are two long-term trend channels (dotted grey lines). One stretches from 1903 as far as 1954. The other one starts in 1937 and is still active today. · The 50 and 200-month moving average (blue and red line) are on track to cross each other for the first time since the Great Depression. I find the Dow’s interaction with its trend channel very intriguing. The 1903 – 1954 channel offered support and resistance at no less than seven major turning points. Most notable is sequence of trend line interaction that occurred following the bust of the 1929 bubble. The Dow sliced back below the upper channel line and continued tumbling below the lower channel line. This led to a strong rally that once again tested the upper channel line (red arrow). The same thing is happening now. The strong post 2009 rally has lifted the Dow high enough to test trend channel resistance. In fact, the Dow has been flirting with this upper channel line off and on since late 2010, but hasn’t been able to stay above it for long. Channel resistance is currently around 13,200. What does this unique constellation mean for investors? Since we are looking at a multi-decade trend line, we can’t use it as a short-term investment tool or signal. Long-term investors should closely watch the Dow 13,200 range. Based on the 1938 analogy, the likely current is a counter trend and long-term investors should use current prices to unload equities and nibble on short positions. Financials – Is the Most Despised U.S. Sector Getting Ready to Rally? Investors are shunning the financial sector. Although financials account for more than 14% of the S&P 500 (SPY), investors (by one measure) have only 2% of their money invested in financials. Some contrarians take this as a buy signal, is it? Knight Capital, MF Global, LIBOR fixing scandal, JP Morgan losses, excessive Wall Street bonuses … there seem to be unlimited reasons to dislike the financial sector (Financial Select Sector SPDR ETF – XLF). When it comes to financials, investors are not only talking the talk, they are walking the walk. Right now financials are the most despised sector in the United States. Of the $900 million invested in Rydex sector funds, only $18 million are allocated to financials, that’s just 2%. However, the financial sector accounts for 14.21% of the S&P 500 Index (SPY), which makes it the second biggest sector of the S&P (behind technology). Extreme pessimism often results in unexpected price spikes. Is the financial sector getting ready to rally? Financials appear to be at an important short-term juncture, but let’s provide some long-term context before looking at the short-term. From the 2009 low to the 2011 high, the financial sector (XLF) jumped from $5.88 to $17.20. Before that, XLF dropped from 38.15 to 5.88. Today XLF trades 61% below its all time high price tag of 38.15. In comparison, the Dow Jones Industrial Average (DJIA) is less than 8% away from its all-time high. Important short-term resistance for XLF last week was at 14.85. This resistance was made up of the July 3 and 27 highs and a trend line that connects the March 27 and May 1 highs. On August 8, XLF was able to close above 14.85. Such a break out is generally bullish. However, the volume on which XLF broke out was significantly lower than average (see chart below). Based purely on the chart and sentiment, the bullish message deserves the benefit of the doubt as long as XLF remains above 14.80. But a break below 14.80 would severely ding the immediate up side potential for XLF. What about the down side risk? 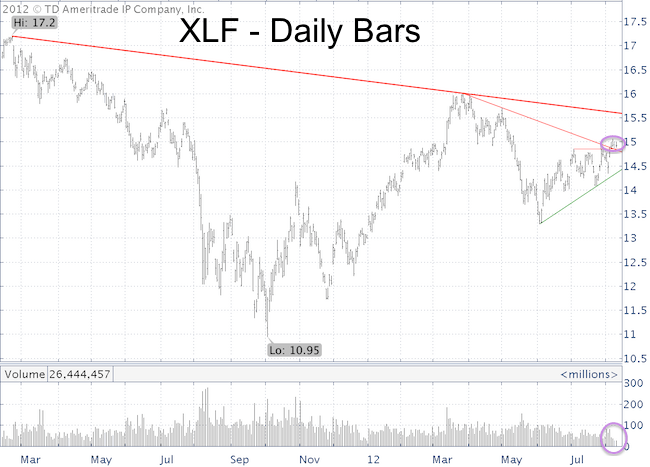 Aggressive investors may decide to sell or go short XLF with a break below 14.80. The initial down side target would be around 14.45 – 14.50.